Located just outside of Indianapolis, Carmel, IN, creates the atmosphere of that much-needed girlfriends’ getaway. Shopping, brunch, wine tasting and a touch of adventure will keep your gal pals staring at the clock all week until Friday finally arrives. Plan a quick getaway to this Midwest destination — here’s your itinerary. As the clock strikes 5 p.m., hit the road for a weekend of relaxation and exploration. Snag some tickets at the 1,600-seat Center for the Performing Arts, where jazz concerts, country stars and comedians take the stage. You’ll be in awe of the intimate setting and Italian architecture of the musical venue. Grab a cocktail and share some small plates at divvy restaurant, located within walking distance of the show and named one of the “Best Restaurants” in Indianapolis. Pop in next door at the newly opened Wine Bar at Matt the Miller’s Tavern to try a bottle of top-notch vino. Want something sweet to split between friends? The Quirky Feather Confectionery is open late with its sweet treats of tiramisu, raspberry tartlets and old-fashioned chocolate chip cookies. As the night sets in, prepare for some coziness of Old Towne Carmel’s Bed and Breakfast, a luxury B&B with three rooms located not far from downtown Carmel. Carmel’s Center for Performing Arts is gorgeous when lit up at night. Enjoy a small plate at divvy. The Old Towne Carmel Bed and Breakfast is an ideal place to stay during your visit to Carmel. Whether you hit snooze or hit the ground running, your first stop should be brunch at either Café Patachou for the lavender prosecco cocktails or Eggshell Bistro, known for its globally inspired plates and Four Barrel coffee. You can’t go wrong with the shakshuka, artichoke tart and sweet potato hash – all handmade from the owner and award-winning chef Larry Hines. You’ll need the carbs and energy before you wander around at the Carmel Farmer’s Market and then the Arts and Design District, a state-designated cultural area where art galleries, eateries and boutiques align. Don’t miss the Evan Lurie Gallery or the unique Museum of Miniature Houses, where tiny dollhouses will have you scratching your head wondering how they made something so tiny. A must-try is the California wine of Peace Water Winery where you won’t regret that second tasting knowing that half of the proceeds go to a charity of your choice. The evening will commence at Convivio, where the Italian artisan cuisine — and pasta — is made from scratch. Brunch at Eggshell Bistro is a fabulous idea, don’t you think? 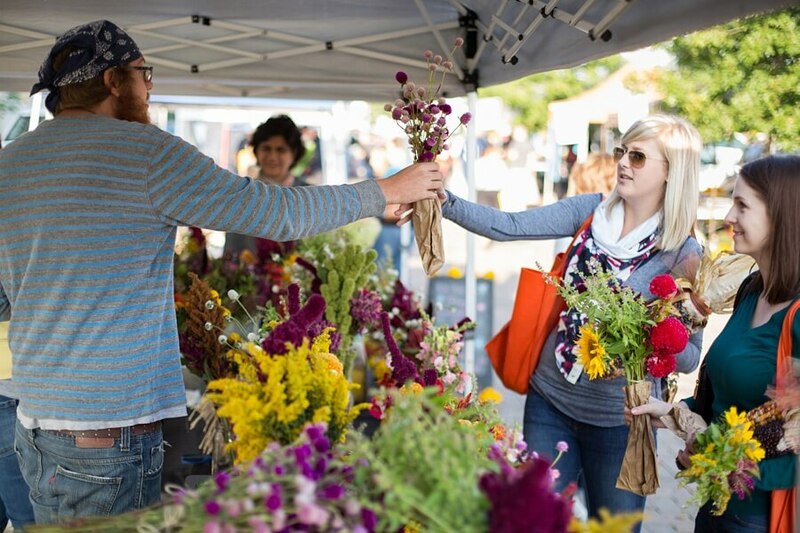 Grab some fresh flowers at the Carmel Farmer’s Market. The Carmel Arts & Design District is a bustling atmosphere. Inspire your artistic side at the Evan Lurie Gallery. You’ll be reenergized by Sunday, and you’ll need it before you rent bikes through Zagster bike share to explore the colorful strip of the 18+ miles of the Monon Trail, which reaches to downtown Indianapolis. Along the way stop at Union Brewing Company to sample some local brews out of steins on the patio while listening to live music and snacking on some of the best authentic Jamaican food at Jamaican Reggae Grill, which is located just next door. I recommend biking through Central Park to see the trails, boardwalks and natural wetlands, or stopping to get touristy pictures with the 17 lifelike statues along the Arts District. You won’t want to miss the scoops at Bub’s Burgers and Ice Cream either, located right off the bike path. Before you wrap up your weekend getaway, grab a bite to eat at a local favorite called Woody’s Library Restaurant, where its name matches what it used to be: a public library in 1914. Hit the Greenway for a little exercise before you head back home. Union Brewing Company is a must before you bid Carmel farewell. SB TIP: Just in time for the holidays, the Christkindlmarkt and outdoor ice skating rink opens on November 18 and offers an authentic German-inspired seasonal experience, complete with shopping, food, drinks and outdoor ice skating. When you’re ready to plan your weekend in Carmel, check out visithamiltoncounty.com for more details and to map out your stay. Find more great travel destinations in our travel section. CLICK HERE!